Ixalan is one fantastic set PLUS it’s also our 75th Prerelease. That means we’re giving away a ton of extra’s this time. Read all about the details and extra’s below, but we do expect to sell out. If you would like to reserve a seat please stop by Active Imagination Family and Arena or call 505 720 8249 to save your seat. You don’t want to miss this one! Join us at Active Imagination Family and Arena for a very special celebration. 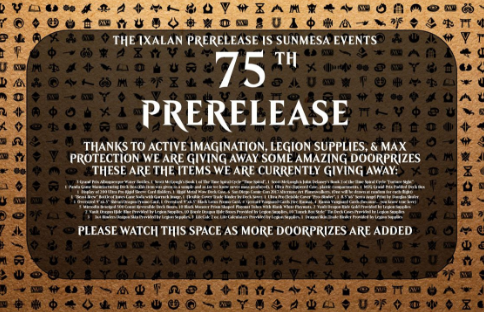 The Ixalan Prerelease will be our 75th prerelease we’ve hosted over the years. As you can imagine we’re throwing one heck of a party. Thanks to our sponsors Max Protection, Legion Events we have a pirate’s horde of giveaways. Check out the list below. We usually give free sleeves? Well this time it’s Free Sleeves -100 of them, Plus Deckbox, Plus Perfect Fit Sleeves. Yes, every player will get 100 regular sleeves, 100 perfect fit sleeves and a deckbox, all just for playing. Pre Registration: Due to our expectation of a complete sell out we are offering Pre Registration. Stop by Active Imagination to sign up in person or call/text 505 720 8249 to sign up by phone. You will not need to pay until you play but we do want to reserve you a slot. Want to Discover Your Treasure? Our door prizes are nuts check em out!